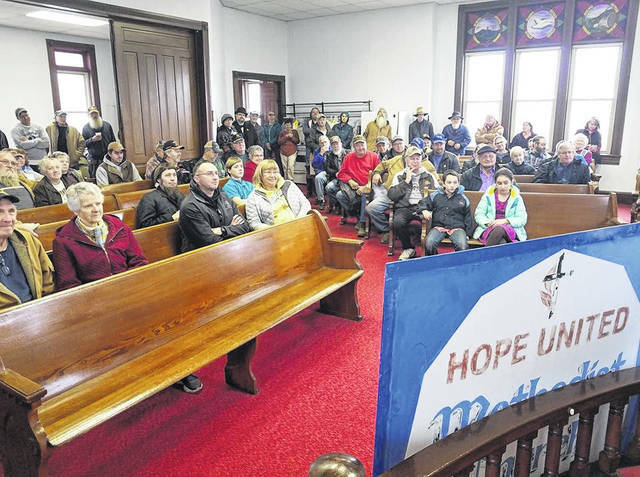 McZENA – A stately white country church, a servant to the community in a rural part of Ashland County for over a 100 years, began its journey to a new life Friday. Over 100 people gathered to watch an auction at Hope United Methodist Church. It was agreed earlier this year that because of the church’s diminishing numbers, congregants there would have to join another religious institution. That was done, but the future of the facilities still had to be determined. The auction, officiated by Dave Acker, known in auction circles, was a friendly affair, though many attending were feeling the gravity of the situation. The church was purchased for $35,000 by Matt Steiner, who said he represents a religious group. He did not want to reveal the name of the persons he was working for, but confirmed the intent is to keep using the building as a church. Acker complemented Hope church members, who he said had kept the facility “up to snuff” and ready for anyone to move in and use. Don Nickles, a trustee, with other church members including Ron and Judy McFarlin, had spent hours assembling and polishing church fixtures so they could be sold. The order of the auction was set so the group buying the building could also be in a position to buy contents. The pulpit, pews, paintings and vestments were auctioned off. Two popular items were a Hammond organ and a Yamaha piano. The organ went for $650 and the Yamaha for $200. Before the auction, rules for the procedure were detailed. The building is located at 2498 County Road 2575, and is on a half acre. It was built in the 1900s. The Lake Township trustees had waived a use restriction for the parcel when it was conveyed to the church in 1886. The trustees have to discuss that issue at a meeting that was scheduled Dec. 3. 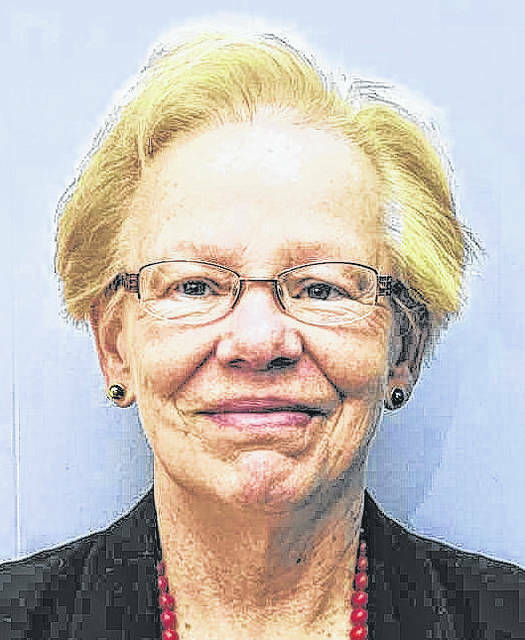 Also, an issue within the Ashland County court system must be resolved. 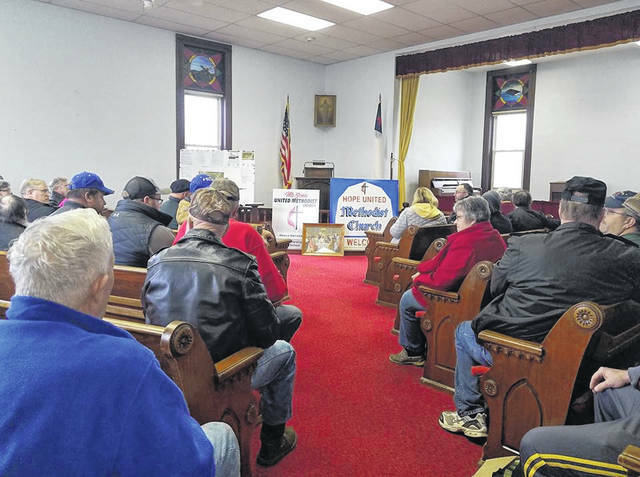 If those items are not accomplished the earnest money deposited at the auction will be returned, Jack Gant, a broker with Gant Realty in Wooster, said. Acker did his duty to stoke enthusiasm for the auction by telling some of the history of the church, and the crossroads village where it sits. There is a special July 4 parade in McZena, but it doesn’t happen until days after July 4. The corner where the church sits is a gathering place on the real parade day, Acker said, because people just can’t wait to see what will be offered as entries in the event. Sometimes, giant harvesting equipment machines roam the crossroads beside Hope Church. He said one thing purchasers of the church might want to consider is a “yard sale” set up to coincide with the July 4 parade. Bidding for the church started at $65,000, but ended at the $35,000 level. An open house had been held at the church two weeks ago, so people could gather and see what was being offered. Several groups of Amish and Mennonite — potential buyers — were present for that event. The final sale for the church came at 11:20, just after the 11 a.m. starting time. A tradition at rural auctions is a food wagon. Acker and Gant told the crowd they were offering the food as gifts to all there.